I'm finished! Yes, I finished adding the trim to my Junebug remix dress last night. I enjoyed doing this weeks at home sew along contest at Project Run and Play. I'm calling this dress the Once Upon A Junebug Dress. 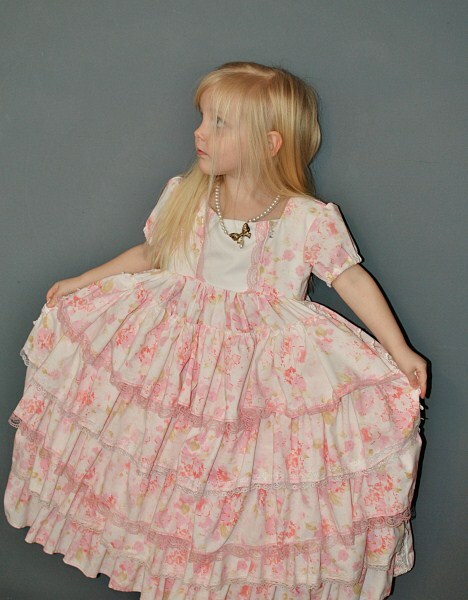 It's the Junebug dress in a fairytale. I didn't change much on the bodice pieces to the Junebug pattern. I put the bodice front behind the bodice sides. I added 1 diamond gem button to the top of each side. I left off the other 4 buttons off because the bodice sides hold the dress in nice and snug. I made the sleeves about 1 inch longer than the pattern. For the skirt I made it full length and added lots of ruffles to the front. and at the bottom of every ruffle. 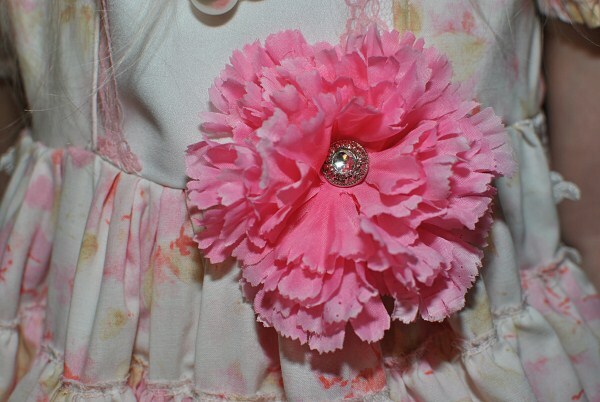 I added a removable silk flower with a button center later today (that's why some photos have a flower and some don't). 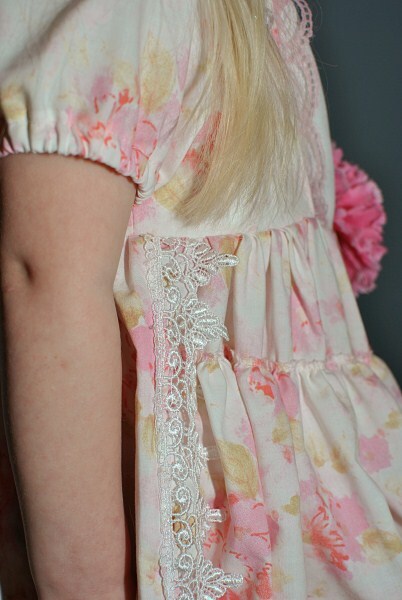 The fabric is vintage and sweet perfect for a storybook princess. 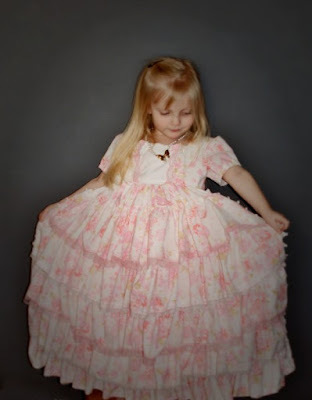 This dress was made from a full size sheet (picked up for $1 at thrift store). Yes! That's right this a $1.00 gown! Well $1 dress with $4 of lace added to it (total cost $5.00). My girls both love it. Here's a photo of Demi (my 6 year old) wearing it. I have to make another so they don't have to share. Zehira (my 4 year old) wore it to bed tonight. I was going to stop her but after remembering the dress is a sheet I decided for tonight I let her wear it to bed. I might have to make her a new dress tomorrow to get this one off her body so i can wash it. 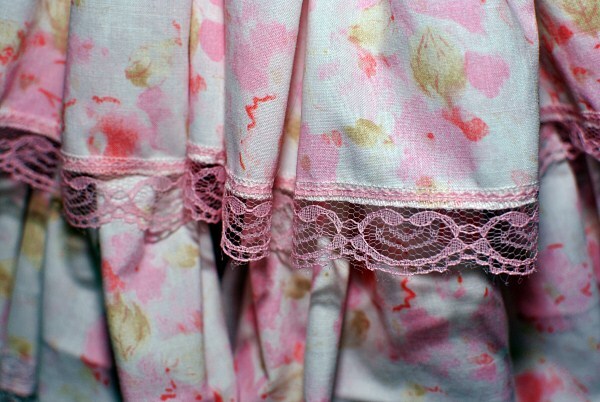 what a pretty vintage sheet you found ! 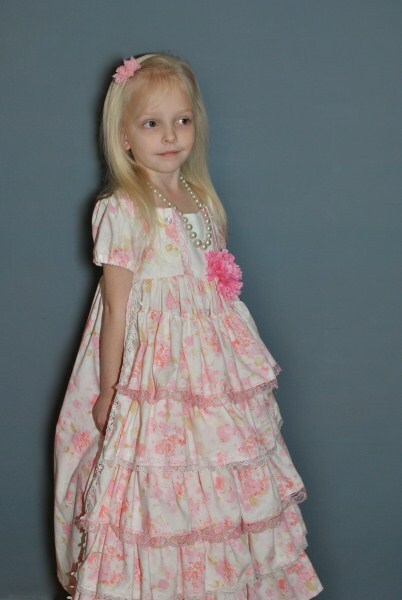 I bet she loves her fairytale dress !